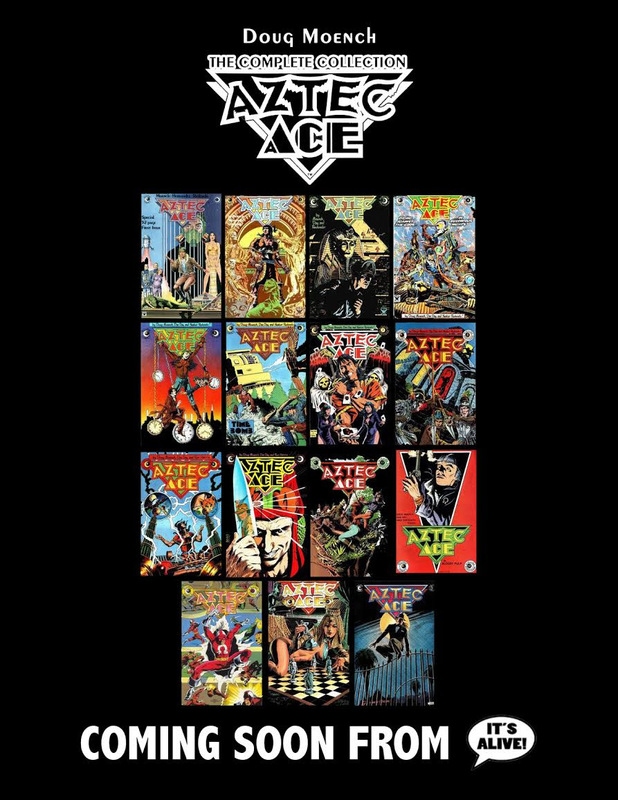 Aztec Ace: The Complete Collection will be a 500+ page, action-packed, intellectual, time-travel adventure starring a citizen of the original Aztec Empire named Caza (AKA Ace). Traveling between the ancient world and the 23rd century, Ace – along with his pupil Bridget Chronopolis and his navigator, the floating disembodied head of Sigmund Freud – struggles to save his own dimension from time paradoxes created by his enemy, the mysterious Nine-Crocodile. 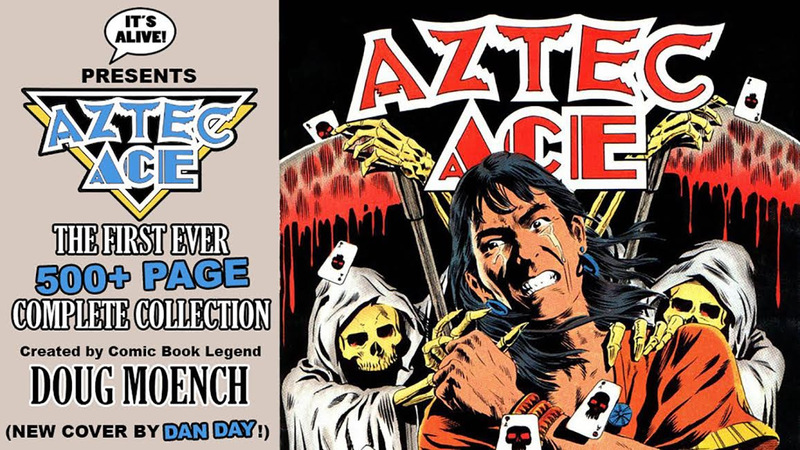 Aztec Ace was originally created and written by legendary Batman scribe and Moon Knight creator Doug Moench, edited by Cat Yronwode, and illustrated by a host of talented artists including Dan Day, Michael Hernandez, Ron Harris, and Thomas Yeates. This collection will mark the first time the original issues of Aztec Ace have seen print in any form since their original publication in 1984 by Eclipse Comics. This project also marks It's Alive! publisher Drew Ford's return to large-format, all-encompassing collections, such as The Puma Blues by Stephen Murphy and Michael Zulli, and U.S.S. Stevens: The Collected Stories by Sam Glanzman, both Eisner Award nominees. Ford has launched a Kickstarter campaign to cover the costs of development, which include a new foreword, intro, and cover, plus the digital scans and restoration of all 15 original issues. To help meet the funding goals (and stretch goals), the Kickstarter will be offering exclusive, one-of-a-kind Aztec Ace sketches from some of the top talents in comics today! Superstar artists including Bill Sienkiewicz, Paul Pope, Jeff Lemire, Michael Avon Oeming, Kelley Jones, Joe Staton, and more have already created Aztec Ace sketches, which will become available for purchase at different times during the campaign! Stretch Goals include a cover gallery of all original 15 covers from the series, a sketch gallery of all the one-of-a-kind Aztec Ace sketches, an Aztec Ace short story written by Doug Moench and illustrated by Tim Sale, and the publication of a never-before-seen 52-page Aztec Ace script by Doug Moench. The campaign also offers Early Bird Specials on PDFs, books, t-shirts, and even original pages of Aztec Ace art by Dan Day! These Specials will only be available until June 6th!